From the Classic Monster Collection comes Bride of Frankenstein, one of the most popular horror classics of all time and an acclaimed 1935 sequel to Universal Studios' original Frankenstein. Note to collectors: This 1999 edition is extremely rare and out of print but available here. The legendary Boris Karloff reprises his role as the screen's most misunderstood monster who now longs for a mate of his own. Colin Clive is back as the overly ambitious Dr. Frankenstein, and Elsa Lanchester stars as the Bride. Directed by James Whale (It was his last film). Special features include: She's Alive! 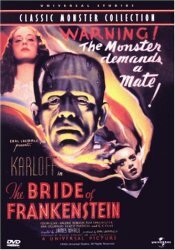 Creating The Bride of Frankenstien, an original documentary feature commentary with film historian Scott MacQueen The Bride of Frankenstein archive, and much more!